More Alien Babies! | What is That and How Do I Eat It? Only this time they’re delicious. I love fennel bulbs, even though sometimes the flavor of the seed or stalks can overpower dishes. This happens a lot with soup, I think, but if you’re going to buy sweet sausages from the Italian place that makes them in-house (and why wouldn’t you? Seriously, they’re delicious. Which Italian place you ask? ALL OF THEM. ), buy the ones with fennel seed rather than without. I kind of feel like fennel is going to grow talons and attack me, but that’s probably because no matter how deep I stuff it into my bag at the market, fronds poke out from among the lettuces and apples and tickle me as I walk, completely freaking me out. They will also attack you every time you open your fridge. Those stalks are pretty mischievous. Or under orders from their alien overlords. Luckily, it’s the benevolent bulb you want to eat, not the tough, stringy stalks. Some stores and sellers sell fennel pre-trimmed, but I don’t really recommend buying it that way since the cut edges get dry and shriveled pretty quickly. If you’re into presentation, save a few of the more delicate-looking fronds to sprinkle on top of whatever you end up making with it. If you’re thrifty, save the stalks to add to other vegetable leavings to make a vegetable stock, or use them in poaching liquid for fish or chicken. They can overpower if they’re the main ingredient, but as an addition they’ll add a fresh almost grassy flavor that guests will find hard to place but can really make something simple taste complex. If you’re not going to eat it right away, store it with stalks on so that it doesn’t get dried out, but don’t store it too long. If it starts to go old, the bulb will get slightly shriveled with brown edges. 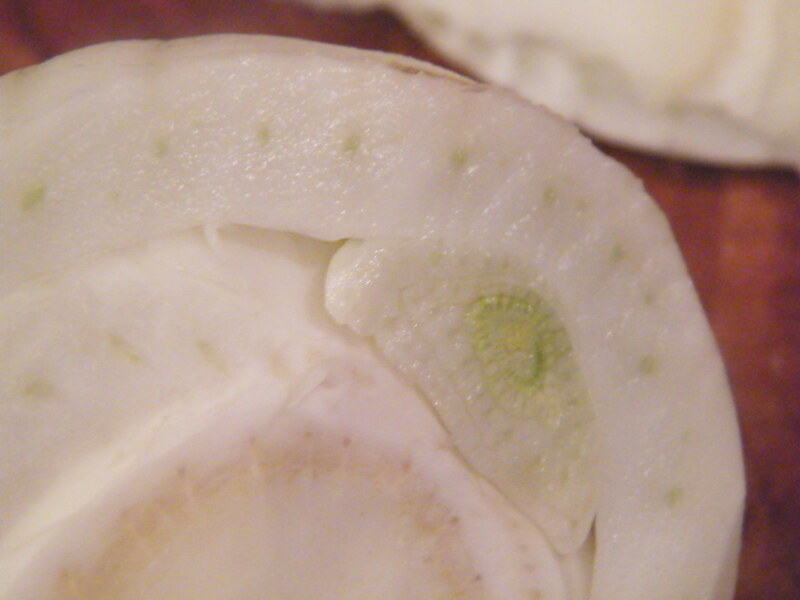 If the outer layers are too dry or brown, you can peel them off and still eat the bulb underneath, but fresher is obviously better. Cut the stalks right where they meet the bulb – basically cut off anything green. Trim the tough bottom part of the fennel as well. There will be something of a disc in the center, depending on how big your bulb is. This is the core. Some people keep trimming and throw out anything solid-looking, or cut the bulb in half at this point and ditch the core; I don’t mind it as long as it’s not too tough. I just chop the entire bulb into fourths or sixths if I’m cooking it and it will soften up, or slice it very thin if I’m slicing it to eat raw. 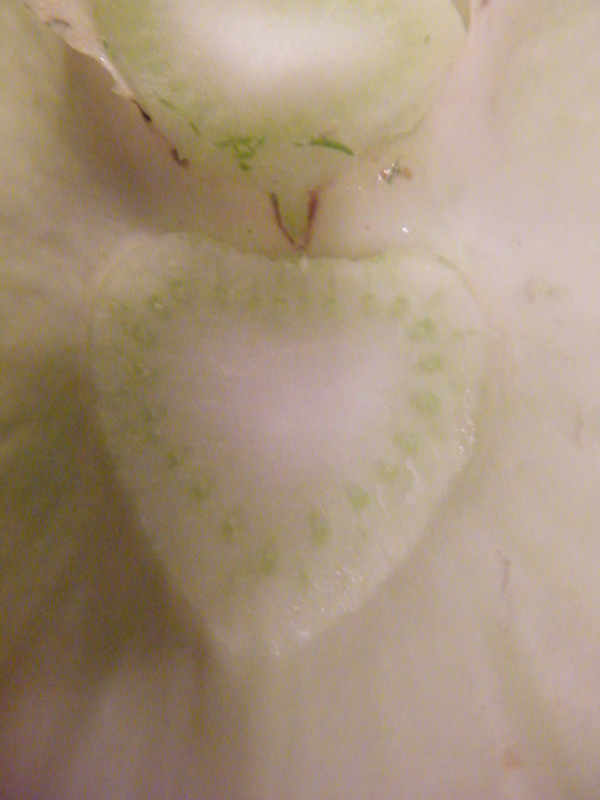 The interior of the bulb resembles celery. It has a slightly tougher outer layer with a more succulent pocketed inner layer. Pockets of deliciousness, that is! If you remember biology, it really should be used for the picture of cambium in textbooks. Xylem and phloem anyone? No? I’m not a fan of celery, licorice, or dill, so I personally resent the comparisons on fennel’s behalf. Fennel is related to all three of these stronger-tasting plants, and while it’s taste does closely resemble anise or licorice, it’s not nearly that potent. If you like licorice, you may either love fennel or find it too bland. 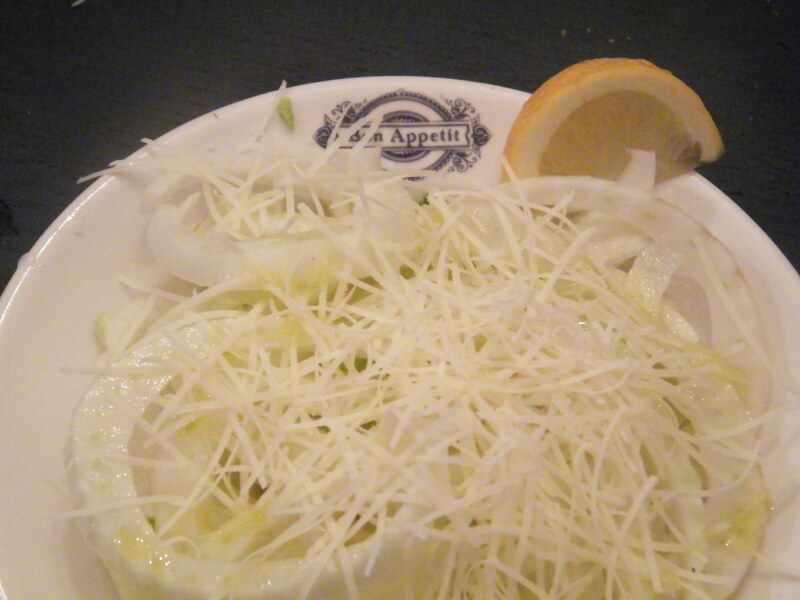 If you don’t like any of the above flavors, like me, you may still love fennel. It tastes like Spring. It has a great crunch and enough moisture that it automatically tastes refreshing. It’s slightly sweet, very slightly grassy, with just a tiny hint of licorice-like sharpness. Just to clarify, the kind of fennel I’m talking about here is Florence fennel – it’s been cultivated to have this big delicious bulb. Other types of fennel, including wild, have a slightly sharper taste and slightly different uses, though they’re just different variants of the same species. There are lots of different ways to prepare fennel, both raw and cooked, but my absolute favorite is also extremely easy. (You may be noticing a trend with my recipes. I’m lazy. I have a toddler. I own a mismatched set of skillets I bought at Marshall’s and one nice omelette pan we received as a wedding gift that I subsequently used metal utensils on and ruined. I don’t really do complicated.) 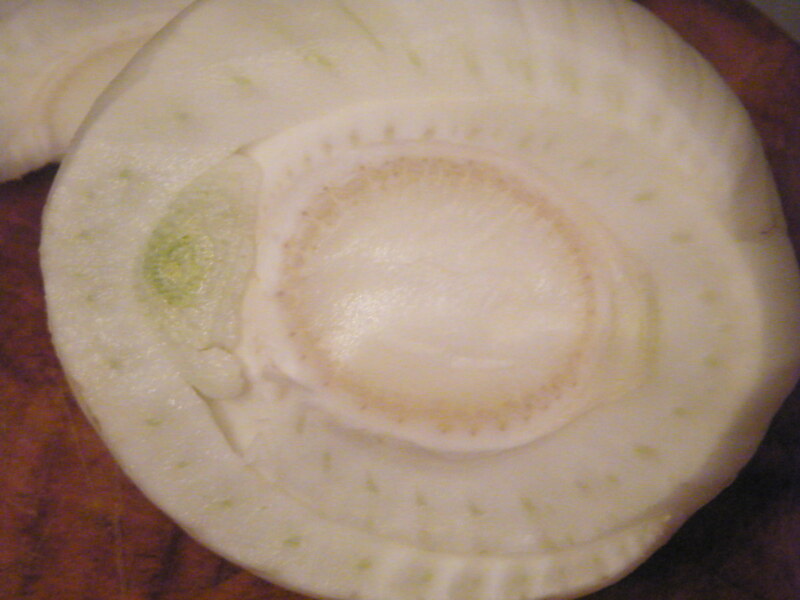 Slice the fennel as thin as you can without injuring yourself. 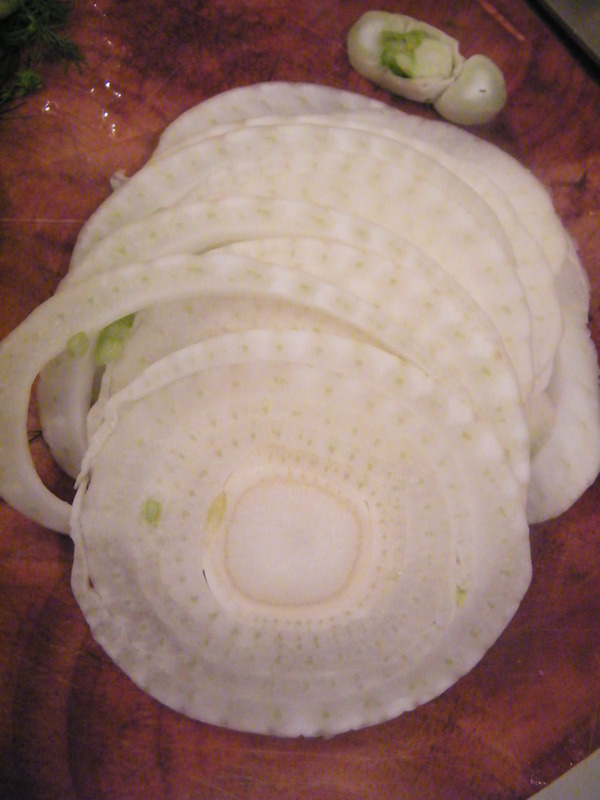 If you have a mandoline, your fennel will look much prettier than mine. Break up the slices (they’ll come apart when you pick them up) so that you can pile them artfully on a plate. Drizzle with olive oil. Squeeze the juice of half a lemon on top. Pick out the seeds that inevitably fell into your salad. Top with a tablespoon (who are we kidding here? I use more like half a cup. It’s cheese!) shaved or grated parmesan (use fresh here, not the stuff in the green can) and sprinkle with a little chunky sea salt. If you’re fancy, top with those saved feathery fronds so it loo ks pretty. That’s it. It doesn’t look very glamorous, but I could eat this salad almost every day. Yes, it’s topped with half a pound of cheese (did I say half a cup earlier? I probably lied), but if you have more self-control or perhaps more lactose-intolerance than I do, it doesn’t have to be. It’s crisp, it’s summery, it goes with almost everything, and fennel is supposed to aid digestion and have other magical herbal properties including lots of vitamins, so that cancels out all the cheese I just put on there. Isn’t that how vitamins work? Peel? Trim. All the parts are technically edible, but it’s the bulb that’s the tastiest. Trim off the stalks and tough bottom part, and peel off any outer old layers if necessary. Edible seed? Yes, though you won’t see it on the bulbs you’ll buy at the market. Fennel seed, pollen, and other varieties will be the subject of another post. Edible when raw? Yes. Raw or cooked are both delicious. Worth the price of organic? Probably. The bulb sits just above ground, so it gets contact with both sprayed-on pesticides and things sitting on the soil. Insects don’t love fennel (in fact, some gardeners use it as a natural repellant), so it shouldn’t need tons of pesticides to grow well anyway. In season: Fennel is a cooler weather crop, so you’ll find it in Spring and Autumn. Spring fennel is usually a little sweeter than Autumn fennel, since an unexpected heat wave can make the plant bolt, making it sharper. Best with: lemon, fish, chicken – milder flavors let the subtler bulb shine. How to Store: In the fridge for up to a week, though if you keep it that long you’ll have some old layers to peel off. 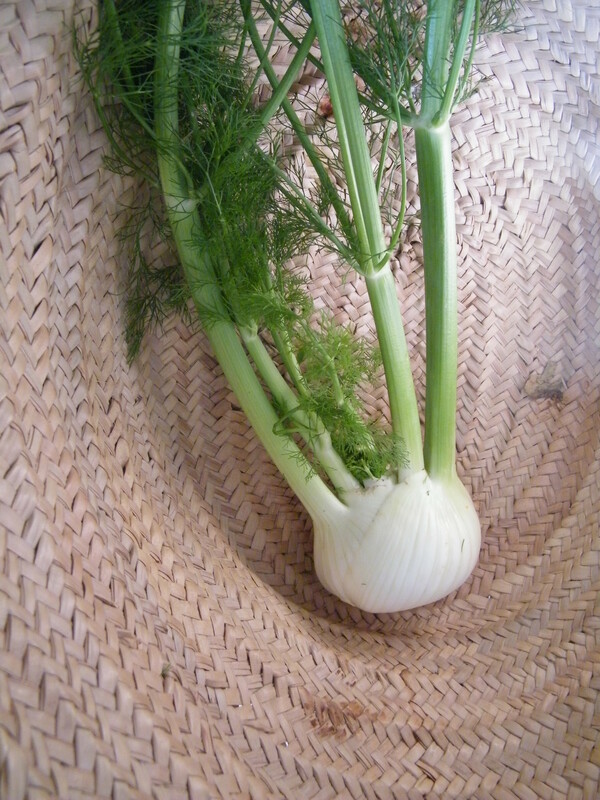 Note on Growing Your Own: Almost every plant on Earth hates fennel, so if you decide to grow it yourself, put it in a pot or raised bed alone, or plant it in a separate area from other plants, especially fruits and vegetables. 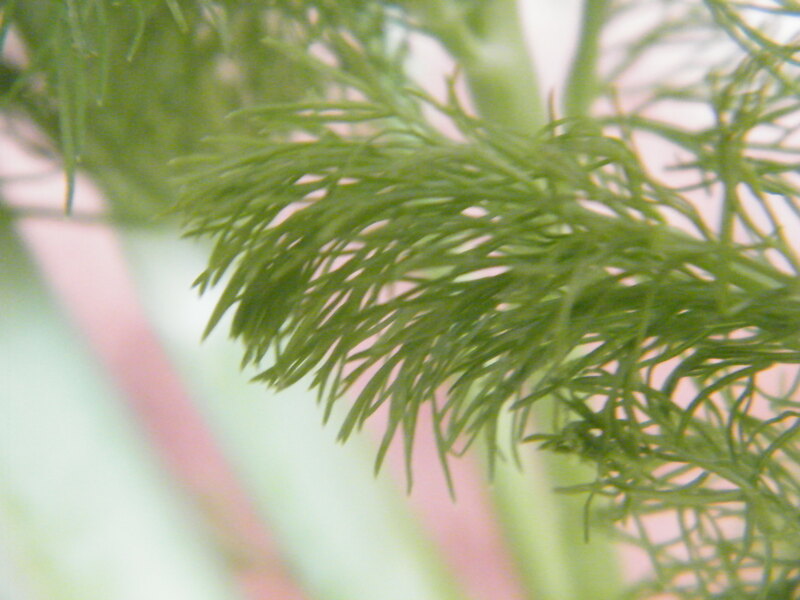 If you plant it anywhere near dill, they’ll cross-pollinate and neither will be the flavor you want.